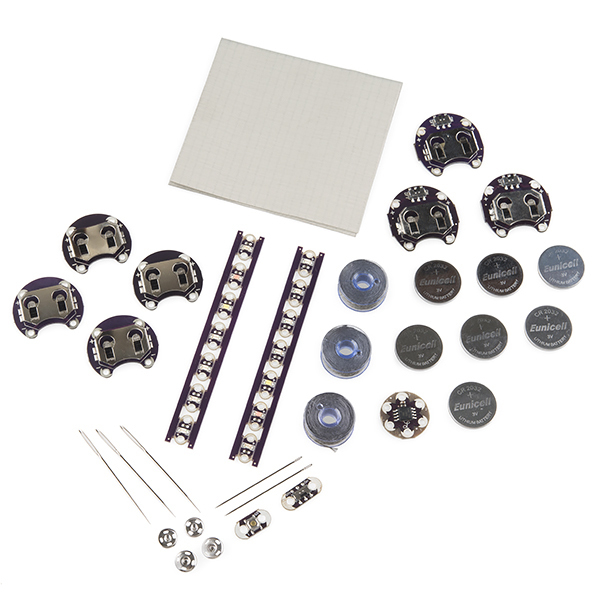 Congratulations on your LilyPad Design Kit! The LDK has been carefully designed to walk you through the hurdles of getting started with e-textiles. If you don't know how to sew, you should have a solid grounding by the time you finish these 6 experiments. If you don't know anything about electronics, we'll have you building microcontroller circuits in no time! Don't know either? BUCKLE UP and let's do this thing! The kit is divided into six experiments, so you'll learn in six easy steps, with lots of links to explain sewing and electronics terminology and basic concepts. It's easy to divide up into bite-sized lessons, or you can power right through the whole thing! The circuits are shown alone, without any projects to obscure the circuit or limit your creativity, but every circuit shown has boundless potential for fun projects! If you put your circuits into a cool project or wearable, take a picture and send it in! We'll be updating this page with inspirational photos of projects using the parts and circuits you're learning.